"I now believe Francis Drake was in Nehalem Bay due to Garry Gitzen's book." "I've read your book three times...it's excellent." "I am enjoying your work and you should be both proud and ready for a fusillade of words from California." "I greatly enjoyed the book, and I thought you advanced your arguments well." 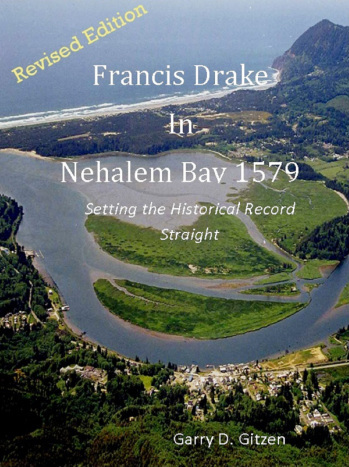 "Francis Drake in Nehalem Bay is a scholarly piece of research and I would recommend its reading to any serious student of Francis Drake or 16th century maritime expansion." -- Susan Jackson, Drake Exploration Society U.K.
"I concur completely on: the flora, the natives, the shell chains and clothing and the boats including language that has been so fouled up by the Drake Navigators Guild." Francis Drake monograph of articles, books, etc. Upcoming Field Trips Available: Some of the topics will be16th century navigation & surveying, Nehalem native culture, and topography. Reserve your personal space now for "Sir Francis Drake's Pacific coast landing". Classes well be held in the private M. Wayne Jensen, Jr. Library. Class size is limited to 3 enrollees. For 2019 summer class qualifications and rates - Please feel free to call 503 368-7959 PST or email Class information. The book is written for all serious students of Francis Drake's Pacific coast landing site. In the author's opinion, and all those with open eyes, puts to rest the dispute between California and Oregon where Francis Drake landed in the summer of 1579. It examines the topography, ethnology, flora & fauna and geology of Nehalem Bay, Oregon with the voyage journal "The World Encompassed". First published in 2008, revised 2011. The book is heavily illustrated, 6 appendices, endnotes, bibliography, index in 263 pages. "Free download is not about selling books. Its about education."